When I started the Playing Card Series, it wasn’t even a ‘series’ in my mind. I painted Shayna Baszler as the Queen of Spades, but the response was so strong I started painting others as face cards. As I got into it, the pieces evolved with ever-complicating concepts that let me still get across the subjects and the auras around them. 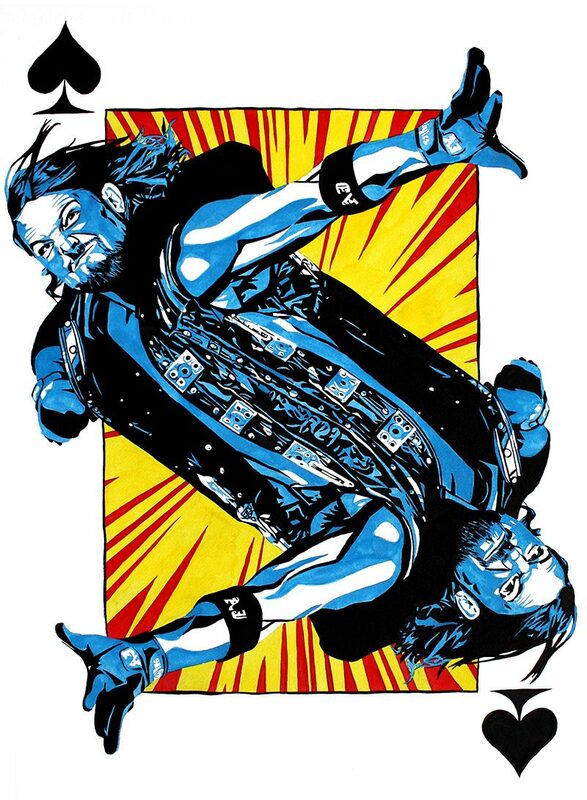 With this AJ Styles piece I tilted the mirrored figures at an angle, speaking to the movement and action we expect from the Phenomenal One. I also added in some superhero-inspired speed lines, again giving cues to make the viewer think of movement and action. The Playing Card Series overall was a fun challenge for me artistically and I’m excited to see what next will push me even further.